I’m as guilty as anyone as believing that the arrival of new ownership next year portends a rebirth for the Dodgers, but of course, a new foundation is still only a foundation. You can’t do without it, but so much depends on what you do with it. The Dodgers should have a vast upgrade in resources in the coming years, from future owners and dramatically rising TV dollars. Will that lead to increased greatness or increased waste? It’s a real concern, and it all depends on the execution originating from the offices on the Club level down the left-field line. One of my big frustrations in the technological age — and keep in mind, I’m as layman as they come with this stuff — is that on the few occasions over the past 25 years when I have gotten a new computer with increased capacity, I can’t fully enjoy it because so many new programs expand to eat up that capacity, sometimes with little purpose. Efficiency rarely seems to be a priority with home computers. The goal instead seems to be to devour the frontier as fast as it appears. That kind of sloppy largesse is not in my vision of the Dodgers. I want them to spend, but to spend wisely. This franchise has so many needs, on and off the field, that new leadership can’t afford to be irresponsible. I believe the next Dodger era can be a great one, but I don’t think greatness comes with a bulldozer. It should come, no matter how many tools are available, with surgical precision. As this year nears a close, I want to offer a particular salute and thank you to one person. This was no less a rewarding a year of parenting for my wife and I than any other, but it did happen to be our most intimidating. Everything’s relative – we are thankful for the health and happiness in our home and only hope it continues. But you could say we dealt with some unexpected developments. To those challenges, my wife responded like a field general. A field general who didn’t hide her fears, but a field general nonetheless. Despite how overwhelmed she felt at times, she did not slink from what needed to be done, doing all the research, finding all the right people to help, making it all happen, and all the while juggling the mundane duties that in the grand scheme of things would have been easy to let slide. At times we felt we were going off a cliff, but she not only kept us from falling, you could now say as we reach year’s end that we actually have seen signs of soaring. My contribution on these matters was mainly to be the one who usually got up in the middle of the night whenever our 3-year-old needed a little love or lavatory. The real mountain-moving was left to my wife. When I think back on the year, I’m kind of amazed by what she accomplished. So to whatever extent you have enjoyed Dodger Thoughts this year, join me in sending a bit o’ thanks to my better half, who shouldered so much of our household burdens and made my work life that much easier. You don’t see her influence, but she makes a huge difference. There is no player on the 2012 Hall of Fame ballot I am rooting to see elected more than Tim Raines. Being second to Rickey Henderson is anything but a crime, but if it weren’t for Henderson, you might call Raines baseball’s ultimate table-setter in the post-segregation era — more than Lou Brock, Maury Wills or anyone else. Raines reached base 3,977 times (44th all-time) with a .385 on-base percentage over 23 years — and that’s combined with being fifth in stolen bases and second in stolen-base percentage. Raines scores high in terms of both peak value and longevity. 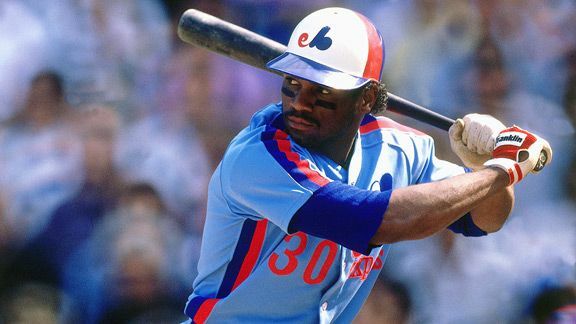 In Wins Above Replacement, according to Fangraphs, Raines is the 84th-best position player in history — the 10 names immediately after his are Joe Torre, Barry Larkin, Mark McGwire, Craig Biggio, Ozzie Smith, Zack Wheat, Edgar Martinez, Lou Boudreau, Billy Williams and Pee Wee Reese. For comparison, just to take a couple of other one-time Dodgers whom many believe should be in the Hall, Mike Piazza is 106th and Gil Hodges is 219th. “Any time we compare Raines to a reasonable group of Hall of Famers, we always end up with the same thing: Raines is just like them,” Tom Tango wrote at the conclusion of a long analysis piece on Raines for the Hardball Times a few years ago, a piece that remains worth your time. “If you have a group of players worthy of the Hall, and an individual player compares very favorably to that group, you have a Hall-worthy player by definition. That is what Tim Raines is: the definition of a Hall of Famer. Whether Raines is compared to the best of the best leadoff hitters or the best No. 3 hitters or the best players of his era, he stands among them. And they stand in the Hall of Fame. The setup: Billingsley rebounded from his struggles in the second half of 2009 to post a 3.57 ERA and 109 ERA+ in 2010, with 171 strikeouts in 191 2/3 innings. In his final 14 starts of 2010, he had a 2.45 ERA with 82 strikeouts in 92 innings, averaging 6 2/3 innings per start. Two days before the season opener, Billingsley, who was paid $6.275 million in 2011, signed a contract extension guaranteeing him $32 million from 2012-14 plus a club option for 2015 ($14 million in salary or a $3 million buyout). A few months shy of turning 27, the expectations for Billingsley were the highest they had been since the first half of 2009, when he had a 3.38 ERA and 119 strikeouts in 125 1/3 innings and made the National League All-Star team. The closeup: After an up-and-down April highlighted by eight innings of shutout ball against St. Louis with 11 strikeouts, Billingsley was encouragingly strong in May. In six starts that month, he had a 2.63 ERA while striking out 41 in 41 innings against 52 baserunners. That included eight innings of one-hit ball against Arizona in a May 14 game that Billingsley lost on an unearned run. The righthander went into June with a 3.46 ERA and 71 strikeouts in 75 1/3 innings. He was complimenting that performance with a potential Silver Slugger season at the plate. After netting a home run, walk and double June 5 in Cincinnati, Billingsley had a .385 on-base percentage and .565 slugging percentage for a .950 OPS. He ended up going 2 for 33 for the remainder of the season – yet that, really, was the least of his problems. In his first three June starts, Billingsley pitched 13 2/3 innings and allowed 43 baserunners and an 11.19 ERA. As in May, he rebounded with what might have been his best four-start stretch of the year: 27 1/3 innings, 29 baserunners and a 1.32 ERA in his final appearances before the All-Star break. But even here, Billingsley’s strikeouts (6.6 per nine innings) were off, and so while he had lowered his ERA back down to 3.87, there was still reason for concern. 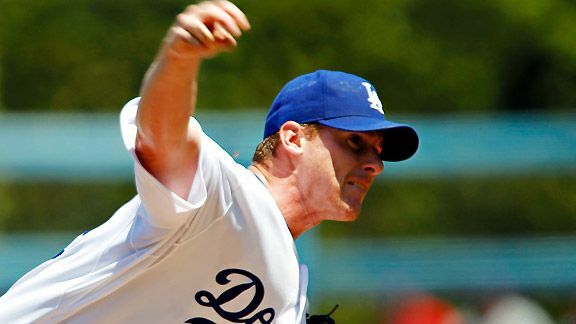 During the season’s second half, Billingsley had four quality starts in 13 outings. It’s indicative of his struggles that in his best post-break performance, July 24 against Washington, he still needed 31 pitches to get out of the first inning before finishing with seven innings of two-hit, 10-strikeout ball. In 11 starts after that one, Billingsley had more than five strikeouts only once. By the end of August, though he was still maintaining an ERA in the low 4s, it was hard not to worry about him. … His strikeout rate has dipped for the fourth consecutive season, from 9.01 in 2008 to 8.21 in 2009, 8.03 last year and 7.46 this season – a figure that is neither bad nor great, but the trend is kind of discouraging. In the past year, his walk rate has gone up from 3.24 to 3.84, virtually as much as his strikeout rate has gone down. In direct contrast to his reputation, Billingsley has repeatedly shown the ability to come back from adversity. From the 2008 postseason, from his broken fibula, from his 2009 slump, Billingsley has always found a way. But this, quietly, might be his biggest challenge of all. It might require nothing more than a tweak, or it might require something much more substantial. Can he do what Kemp did? In the history of the Dodgers, only eight pitchers have had more strikeouts before turning 28 than Billingsley, and three of them are in the Hall of Fame. Only 13 pitchers have had a better park- and era-adjusted ERA before turning 28 than Billingsley. He is, objectively, one of the best young pitchers in more than 100 years of Dodger baseball. Another one of those is Billingsley’s teammate Clayton Kershaw, who poses a standard that Billingsley probably won’t be able to live up to. But Billingsley’s inability to match Kershaw isn’t what will make or break him. He doesn’t have to be Kershaw-good to be good. Yep, as down as many people were on Billingsley by the end of 2009, there was even more reason to be in 2011. Finishing the year one win shy of his third consecutive 12-11 season, Billingsley had the worst ERA (4.21) and ERA+ (88) of his career, and his worst WHIP, walk and strikeout numbers since he was 22. As with Andre Ethier, a comeback season from this former All-Star could make a big difference in 2012 for the Dodgers, who can’t afford another year of two stars and 23 whatevers. They still have to fill Prince Fielder’s shoes at first base, but the Milwaukee Brewers nevertheless just made a nice pickup in Joe Block, hiring the erstwhile DodgerTalk host to do play-by-play, working with no less an entity than Bob Uecker. I continue to maintain that it’s mostly much ado about nothing whether or not Frank McCourt can try sell the Dodgers’ post-2013 TV rights ahead of schedule, because we’ve been told over and over again that any agreement on those rights is non-binding for the next Dodger owner. … I’m going to be perfectly honest with you. I’m not predisposed to have any sympathy for Fox, but I have tried over and over again to wrap my head around today’s decision and I haven’t figured out how it helps the Dodgers’ maximize their sale value, and therefore why it served the court any purpose to nullify Fox’s right to keep exclusivity on the Dodgers’ post-2013 rights until next fall. Often when you read TV or film criticism, you see the word “manipulative.” I’ve spent a lot of time thinking about what this word means in the two weeks since I saw a screening of “Extremely Loud and Incredibly Close,” which officially opens Christmas Day, because if any film is manipulative, this one is. What I concluded is that a manipulative film is one crafted to make you feel a certain way in a given moment, with little regard to the film’s own internal logic and sometimes any logic at all. A plotline, a character or a scene doesn’t have to make sense, because if it generates a strong enough feeling, the audience won’t stop and ask questions. That works except for the audience members who find the whole thing preposterous, as I did with “Extremely Loud.” (And I don’t appear to be alone.) The way the characters behave in this movie, the way the story unfolds, is so obviously phony that I was gritting my teeth through almost the entire enterprise. For example — trying to avoid spoilers here — there’s a major plot element in the movie that defies belief. And then, in an effort to explain that element, the film introduces an even more insane element. All of this happens so that you can undergo this theoretically cathartic experience, but the minute you question it, the entire film falls apart. Another word you’ll see in TV and film criticism is “forgivable,” when a viewer is willing to let some things go because the ride is worth it. Some will feel differently, but for me, what happened in “Extremely Close” was unforgivable. Extremely and incredibly so. I would say it was calculated, except I don’t doubt the filmmakers’ sincerity. I don’t doubt that it all made sense to director Stephen Daldry and screenwriter Eric Roth, who adapted the novel of the same title. But I think they were suckered by their own emotions. It felt right, so they didn’t really examine whether it made sense. They meant well. Not that I don’t doubt they want their film to succeed financially, but I’m willing to believe they saw their path to financial success depended chiefly on making the best possible film. I find myself asking whether the same could be said about Frank McCourt. Did he have the best intentions but severe blind spots, as he now would have you believe? Or was he extremely proud but incredibly lame. I’m not willing to say that McCourt didn’t care at all whether the Dodgers won or lost. His ultimate goal was personal wealth, but that doesn’t make him unique — far from it. However, McCourt’s priorities did conflict in a harmful, cynical way. He didn’t operate as if the Dodgers’ success was a path to his own success. The Dodgers were something to exploit. And he’s always tried to tell us otherwise. How phony and manipulative can you get? If you looked at their past eight seasons as a movie, the McCourt Dodgers are actually worlds better than “Extremely Loud and Incredibly Close.” But as the man behind the camera, the man who has put the franchise at such a disadvantage, Frank McCourt deserves the figurative tomatoes that are thrown his way. The Dodgers have announced their invitees to their annual January developmental minicamp, reports Ken Gurnick of MLB.com: pitchers Steven Ames, Michael Antonini, Rubby De La Rosa, Stephen Fife, Shawn Tolleson, Josh Wall, Allen Webster and Chris Withrow, and position players Alex Castellanos, Griff Erickson, Tim Federowicz, Tyler Henson, Alfredo Silverio, Scott Van Slyke and Matt Wallach. The developmental camp is as much a tutorial about off-field preparation for becoming major-leaguers as anything to do with on-field performance. Prince Fielder is just there for the taking, writes Tim Brown of Yahoo! Sports. Jonah Keri writes at Grantland about the Yankees’ new austerity (relatively speaking). Also at Grantland, Rany Jazayerli writes about how teams trading established players for prospects might be getting the short end of the stick more often than you realize. How about a Grantland hat trick: Jane Leavy writes about Julia Ruth Stevens, Babe Ruth’s last surviving child. Andy LaRoche has signed a minor-league deal with Cleveland. Chan Ho Park has signed to pitch in his native South Korea for the first time (news via Brett Bull). … The Hanwha Eagles said the right-hander had signed a one-year deal worth 24 million won ($20,600). The Eagles had planned to pay Park 400 million won per season with a club option for another 200 million won. But the money will instead be donated to a fund for amateur baseball at Park’s request. The 38-year-old said he would also donate his salary for the development of youth baseball. … The Dodgers generated about $240 million in revenue last season, according to the book. That figure would be essentially even with 2006 and down 17% from a record $289 million in 2008, according to records filed in Los Angeles Superior Court. The Dodgers’ revenue has declined every year since then. The Dodgers turned a profit of about $2 million last season, but before debt payments that almost assuredly turned that small profit into a double-digit loss. The Dodgers’ profit before debt service dropped about $27 million from the 2010 season. The Dodgers’ debt exceeds $599 million, according to the U.S. Bankruptcy Court testimony of the investment banker leading the sale on behalf of McCourt, the outgoing owner. The bid book also reminds prospective owners of an annual $14-million payment the Dodgers must provide as rent at Dodger Stadium to another McCourt entity not included in the sale and says that figure is scheduled to increase as soon as 2015. Also, Forbes has more on the bid book revelations. Meanwhile, Dodger creditors are concerned about the potential liability in the Bryan Stow lawsuit against the franchise, writes Shaikin. … The four alleged victims told the Inquirer they were molested by Conlin in the 1970s, when they were between the ages of 7 and 12. The Inquirer reported that prosecutors took statements from the four last year but could not act on the allegations because they are beyond the statute of limitations. The law in New Jersey does not allow for cases to be prosecuted that occurred and were not reported prior to 1996. Craig Calcaterra of Hardball Talk discusses how the Baseball Writers Association of America found it important to reiterate that Conlin’s 2011 J.G. Taylor Spink Award is not affected, without acknowledging the gravity of the charges, and how some of the BBWAA members felt that was, as Andy Martino of the New York Daily News wrote, a “tone-deaf” statement, regardless of the ultimate outcome of the case. … I first found out the Inquirer was working on a piece about Bill Monday. I read a draft of the piece this afternoon. It bears repeating all the necessary caveats, of course: at present, these are allegations. Bill has not been proven guilty or even charged with anything. That said, I have to say the story made my stomach turn. I can’t shake the disgust and rage I felt after reading the allegations in the piece, nor can I stop thinking about the victims. I have known Bill Conlin since 1990, and before that, I knew him as a legendary voice on the page. I simply do not know how to reconcile what I’ve read with the man I know. I spoke to him today. He offered to retire and I immediately accepted. I knew I’d never be comfortable running his byline again. For a long time today, we struggled with how to best acknowledge this story without knowing the facts or reporting on it ourselves. It is a strange and sad time in the newsroom, and we will do our best to cover this as if it were any other high-profile figure in Philadelphia. But of course it is not just another high-profile figure in Philadelphia. Conlin has been synonymous with this paper for five decades, and to pretend that we know how to approach a story like this is to insult your intelligence. All I can promise you is that we will attempt to be as thorough and fair as we can possibly be – not just to the facts of the story – but also to you, our readers. And that means being as open and transparent as we can be. Since this is such uncharted territory, I don’t know precisely what that will look like. I do know this: This is a tragedy. It’s tragic for the victims, for Conlin’s family, for the family of the Daily News, but also for the familial relationship we have with our readers. Like me, you’ve grown up with and trusted Conlin’s bellowing voice. Now that trust is compromised by horrific allegations. When I spoke with my stunned staff today, I found myself uncharacteristically at a loss for words. But then the reporters and editors among us started speaking up. They wanted to report this story. It was, for me, an oddly inspiring moment. They reminded me: This is what we do. We hold people accountable, and we’ve done that with everyone from mayors to Jerry Sandusky. Now we just may have to do it with one of our own. It says something that the news is mentioned only in passing in this ESPN.com article on Colorado signing Michael Cuddyer, but former Dodger Casey Blake, remembered here, has agreed to terms on a deal with the Rockies. Pending a physical, which is a little more than a formality given Blake’s health issues in 2011, Blake has a one-year, non-guaranteed deal worth $2 million, with another million in incentives. The modest deal reflects how hard it was for Blake to stay on the field. Should the Dodgers have kept him? The likeable Blake did deliver in 239 plate appearances a .342 on-base percentage and .371 slugging percentage with a positive ultimate zone rating at third base, figures that new backup third baseman Adam Kennedy will be challenged to match. But much depends on whether the 38-year-old Blake’s physical condition stabilizes or worsens in 2012, something we have no idea about. In the end, it’s possible he could do well enough to cause some Dodger fans frustration, but the Dodgers probably aren’t going to worse off without Blake in 2012. Update: Jeff Aberle of Purple Row is a big fan of the signing. Ronald Belisario is facing a 25-game suspension if he returns to the major leagues, a possibility that became more likely after Dylan Hernandez of the Times reported that Belisario had been granted his long-awaited visa to return to the United States after missing all of the 2011 season. Chad Moriyama isn’t confident that Belisario, who turns 29 New Year’s Eve, will be worth the trouble after what he deems a somewhat lucky 2009 – a year in which Belisario really shone with a 2.04 ERA and 64 strikeouts in 70 2/3 innings – followed by a troubled 2010 season with a 5.04 ERA, declining strikeout rate and absences due to injury and substance abuse treatment. But relief pitchers with potential and low salary are the best gambles Ned Colletti makes. No pressure – we’ll just see what happens. The quietest period in Dodger Thoughts history was after the birth of my daughter in September 2002. I had only started the site three months earlier, had fewer than 10 readers daily and was experiencing a life change like no other. I didn’t post for the remainder of the year. I can’t remember what it was like. That is, I can remember my infant daughter, but I can’t remember what I thought about the absence of blogging. I can’t remember if I intended to restart, or if my mind had just gone blank. I can’t remember if I even thought about it during those black-of-night winter moments with my girl. I remember those bleary nights now so fondly. I was so tired, a tired I haven’t shed in the years since, but I’m not sure my mind has been so clear, so uncorrupted, as it was during those three months. She was a good baby, too. She kept us up, but she was a good baby. There were times as a baby she would wake up in the morning at 7 and just sing to herself in her crib. A lullaby for her sleepy parents. In early January the next year, shortly after my girl had slept through the night for the first time on a holiday vacation to Carmel, I remember sitting in my cubicle at the Los Angeles County Museum of Art and thinking that I might be ready to start Dodger Thoughts again. And I did. And I haven’t stopped since, for nine years and two more kids. Not for nine years has there been a day that I haven’t thought about this site. I can’t say that about anything else except my wife and children. Catching up today on some news new and old. Many of these items were tweeted by me over the past several days – don’t hesitate to follow. Bill Shaikin of the Times explains why Frank McCourt won’t renege on selling the Dodgers. Here’s a great piece by Chad Moriyama on the lazy comparisons baseball folk have been making between potential big-leaguer Yu Darvish and other pitchers from Asia. Roughly 40 percent of the 2012 Dodger roster will be at least 33 years old next year, writes Mike Petriello of Mike Scioscia’s Tragic Illness. Vance Lovelace and Rick Ragazzo will have greater influence in the Dodger front office, reports Ken Gurnick of MLB.com. More than five years ago, I wrote about the legal action over payment of former Dodger Paul Shuey’s 2004 salary. Amazingly, as Shaikin notes at the Times, the battle is still going on. Sandy Koufax, Maury Wills, Don Drysdale, Orel Hershiser, Steve Garvey, Davey Lopes, Bill Russell, Ron Cey, Mike Scioscia, Tommy Lasorda, Walter Alston and Fernando Valenzuela will all be featured in one way or another among the Dodgers’ 2012 bobbleheads. Rubby De La Rosa’s injury was costly to the Dodgers in more ways than one, notes Mike Newman of Fangraphs. Edwin Jackson is a better sign than C.J. Wilson, writes Joe Sheehan at SI.com. Dodger hitting guru Dave Hansen is holding a baseball camp for kids ages 7-15 beginning December 19, according to Roberto Baly at Vin Scully Is My Homeboy. Change in the National League West: San Diego traded Mat Latos to Cincinnati for Edinson Volquez, Yonder Alonso, Yasmani Grandal and Brad Boxberger, while Colorado signed Michael Cuddyer for three years and $30 million. John Sickels has more on the Padres’ pickups at Minor League Ball, and there’s more reaction compiled at MLB Trade Rumors. The Arizona Diamondbacks are going to recoup millions through a buyback of stadium construction bonds, reports Daniel Kaplan of Sports Business Journal. Kirk Gibson: The NL’s most untraditional manager? Maybe so, says Jacob Peterson of Beyond the Boxscore. USC grad Jason Lane, 35 this month, is returning to his pitching roots to try to keep his baseball career alive. Dwight Evans was one of my favorite non-Dodgers of my younger years. Here’s a nice piece on him by David Laurila at Fangraphs. Harrison Ford has been cast as Branch Rickey and newcomer Chadwick Boseman as Jackie Robinson in the film “42,” reports Justin Kroll of Variety. “Moneyball” received four Golden Globe nominations from the decidedly unsporty Hollywood Foreign Press Association, the latest sign of appreciation for the film from a non-baseball audience.